You’d expect more drinking in animated cartoons, but at least in America there’s a dearth of boozed up cartoon characters after the joy of “Pink Elephants on Parade” in Dumbo. Even Looney Tunes cut back on the drunks and most of them got wasted on dosed cough syrup. The Night Is Short, Walk On Girl is a drunken fantasy that doesn’t leave you with an animated hangover. Director Massaki Yuasa gives us a less violent vision than his previous Mind Game. This is a fun and strange vision of a night out in Kyoto’s entertainment district. This is a world of booze, dirty drawings, used books and a touch of love ruled over by a manic pixie dream girl. A bunch of college students are out enjoying themselves on a weekend night when Senpai notices the “black-haired maiden” named Kōhai that he’s had a massive crush on. But he’s too much of a bumbling klutz to follow through with letting her know his feelings toward her. Instead he’s spent a lot of time appearing in the same places she’s at. In his mind, he sees this as a way to get her to notice him and how they seem to like the same places. Of course an ordinary person would see this as a stalker move. Senpai loses her as she hits the town and both begin a hallucinatory adventure. First Kōhai runs into a guy called The Pervert at a cheap bar. This is where we learn two things about her. First is she isn’t going to put up with a pervy guy. This leads her to hooking up with two other people who are going party hopping. At their first party, we learn the second revelation that Kōhai can pound down drinks like Wolverine without getting sick or blacking out. It’s all like water to her. She can’t out drink a demon. Senpai does want to impress her and discovers that she really wishes she could get a lost childhood book back. He freaks out when he finds out that there’s a copy at a used book fair in a park. The price of the book is outrageous, but he’s willing to do it for a chance to get her attention properly. The Night Is Short, Walk On Girl is a joyful celebration of odd things that can happen when you just go with the flow on a Saturday night. Kōhai is a sensational character since she is bubbly, fun and fearless against so many creatures of the night. Senpai has a major chance to be more than her stalker as he wants to attract her attention. The movie was adapted from an illustrated novel of the same name. Director Massaki Yuasa makes the films as bubbly, fun and fearless as Kōhai. 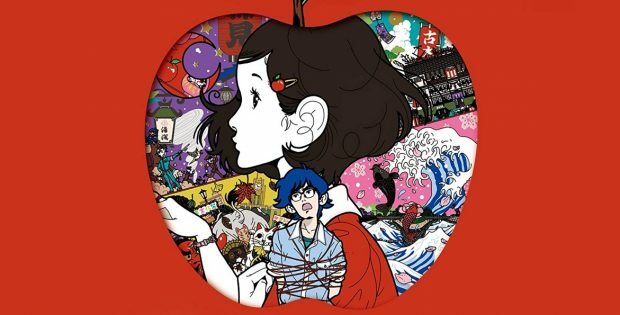 Yusasa has a history with the author since he turned The Tatami Galaxy into a TV series that dealt with the same Kyoto school kids. Except the main characters aren’t part of the series so don’t worry about missing out on anything. Just show up and enjoy a bar crawl to the edge of a dream state. Just whatever you do, do not create a drinking game based on The Night Is Short, Walk On Girl. The video is 1.78:1 anamorphic. The 1080p transfer brings out the details of the various spots around Kyoto. You can order off the drink menu. The audio is 5.1 DTS-MA HD in Japanese. The subtitles are in English and French so you can follow along. DVD with all stuff from the Blu-ray. Interview with Masaaki Yuasa (6:35) has him discuss revisiting the animated Kyoto and making it into a Theatrical film instead of a TV series. Trailers (6:37) includes the full US trailer and the Japanese trailers. They made sure people know that this is a sweet film that isn’t for kids. Shout! Factory and GKIDS present The Night Is Short, Walk on Girl. Directed by Masaaki Yuasa. Screenplay by: Makoto Ueda. Starring: Hoshino Gen, Kana Hanazawa, Hiroshi Kamiya, Ryuji Akiyama, Kazuya Nakai, Yuhko Kaida. Rated: Unrated. Running Time: 92 minutes. Released: January 29, 2019.